We talk about the solo tour, the late Pat Torpey, the recent Mr Big live album, a new Mr Big release and tour in 2019, a potential solo album, recording with Avantasia and more. NI ROCKS – Hi Eric, thanks for taking the time to talk to Rock Radio NI. ERIC – Thank you. You know where I am right now? I’m in the bathroom of the Hampstead Hotel in Birmingham, England (laughs), because it has better acoustics. It’s ironic as I did one of our songs; I can’t remember which record it was, it might have been a song called “Mr Gone” on “Bump Ahead”, I think it was, and I sang it in the shower of the recording studio because it had better reverb! Anyway, food for thought! NI ROCKS - Before we start talking about the European solo tour that you’re currently on, I wanted to chat about Mr Big. I just played the track “Alive And Kickin” from the recently released album “Live From Milan”. That album of course includes some of the last recordings with the late great Pat Torpey on drums. The album release must be slightly bittersweet for you? ERIC – It is a little bit. I wish that wasn’t his last. I wish we’d also done another recording with Pat. I think the last real drumming recording was one of those “Live at Budokan” and Pat only played “Just Take My Heart”. But you know it wasn’t just his drumming, it was his vocals. He was my second and then it was Billy and Paul; the harmony guys, they would harmonise to me. He had a voice like Paul McCartney and his energy and his spirit were great. I totally miss the guy so much. When he was on stage with us I knew he was hurting. I could see it right before he would come out for that song “Alive and Kicking”. He would come out and I could see him over there, breathing a little hard and doing his thing, shuffling a little bit. Then he’d come out and it was show time; he was the consummate professional. It’s still hard man, it’s been only a couple of months. NI ROCKS – The band has done quite a few live albums in the past. How did you feel about doing this one? ERIC – Truthfully, I was caught off-guard on it. I think it’s a good rock n roll record. It’s not perfect and it’s got a lot of open wounds and scars; there are some mistakes and that makes a kind of personal vibe to it. It’s one really good rock n roll gig. It was super hot in there I remember; boiling hot, I was sweating like Janet Jackson! It did catch me off guard a little, there were a couple of camera guys on stage running around and I felt I was performing for the cameras. I don’t like doing that, I just like performing for the audience. But after a couple of songs I forgot that those guys were there. I guess that’s how they do it on the reality TV world. I thought it was good, I thought it was a good earthy rock n roll record. I don’t think it was one of our best, but I think it definitely captured us on like a week-day rock n roll gig. NI ROCKS – You’ve been quoted as saying that there might be a new Mr Big album next year, but that it could very well be the last. Have you anything you can add to that or do you just want to leave it at that? ERIC – Yeah I do. I’m the one getting everyone together for conference calls and e-mails and what we want to do. I really want to do it and I want to spend more than six days on it like we did with the “Defying Gravity” album. I want to be a little more prepared. I want to do a new record and I also want to have a couple of different drummers on it – one’s that Pat really liked; maybe Mike Portnoy, Gregg Bissonette, Ray Luzier from Korn, I really like his playing. Just get some great drummers to do an ode to Pat Torpey. We don’t know if we’re going to do an album or an EP; it kinda depends on the songs. If we only have six songs then there’s your EP, but if we have more we’ll cut an album. We only have a little bit of a window of opportunity because Paul is on the road pretty much the rest of the year and then we might have an opportunity in February to cut something. But we are going to do a tour in June and July and then come home for a couple of weeks and then try to do it as much as we can for about three or four months. But yeah, that’s the last hurrah, that’s it. It just feels a little uncomfortable to keep going without Pat Torpey. NI ROCKS – You mentioned writing songs. When Mr Big songs are being written, do you all get together to write together or do you each bring different things to the recording studio? ERIC – Both. I think the last time we got together; me, Paul, Billy and Pat, was when we wrote “The Stories We Could Tell” album. We wrote “Gotta Love The Ride” as the first song on that. It all depends; everybody is gone all the time doing their own projects and trying to get everyone together is hard. Here’s what we used to do – Paul will write a few tracks, he calls ‘sniglets’, that’s kinda weird, and he will send that tape or CD or whatever to me and I’ll write lyrics and melodies. Then when we eventually get together for two or three days at a rehearsal studio, it’ll be – you know that song that has that weird off timing thing in C or whatever – it’s called “Merciless”; something like that. That’s how we had been doing it for years. A lot of times, Billy, Pat and Paul would just jam out ideas and they’d send them to me and I’d break it all down and try to get five good songs out of it. (Laughs). It was like so many solos, trust me, you know what I’m talking about! NI ROCKS – The last studio album as you mentioned was “Defying Gravity” in July last year. I thought we’d play a track from that album next. Would you like to pick one and tell us something about it or why you’ve picked it? ERIC – I particularly like the song “Everybody Needs A Little Trouble”. It was one actually that we did spend a little time on. We only had six days to record that album, but Paul had given me this lick, this bluesy, kinda Bo Diddley lick. The hotel was right next to the recording studio in LA and I kinda wrote it on the spot and we worked on that song a little longer than any of the other songs. And it was the most simple song to do but we just had fun jamming on it. Really cool, fun kinda old blues rock track. NI ROCKS - You’re currently on a solo tour in Europe. The first UK gig was in Edinburgh a few days ago. You play Belfast on 26th October. For anyone who hasn’t been to one of your solo shows, what can they expect? ERIC – Anything and everything. I actually do play a lot of Mr Big songs and convert them into this country rock flavour – like “Daddy Brother..” and “Alive and Kickin”. If you’re a fan of the Mr Big music and like “To Be With You”, “Just Take My Heart” and “Where The Wind Blows” and even Richie Kotzen was in the band he wrote a song called “Shine” that I really love – we kinda did this duet together; I play that song. Tonight, my guitar player accompanist David Cotterill, who plays in the band Demon and is a great guitar player, we really have a musical chemistry, we were just learning “..Gravity” and we were going to play that tonight. I’m throwing in a couple of my solo songs and we do a couple of covers. This is kinda funny and nobody likes this at all, but I just do it for shits and giggles and I love doing it myself – I do “To Be With You” and then I do a country version of it. And everybody is looking at me with this quizzical look like ‘what the hell are you doing?’ This is for me, (Laughs). I’m not sick of the song, I just love messing around. And if someone is going to see me for the first time, it’s about an hour and a half or two hours of music and about three hours of comedy! NI ROCKS – You mentioned there that you’re working again with guitarist David Cotterill. How did that relationship come about? ERIC – I was playing in Nottingham about three years ago just by myself. Not at Rock City, right next door in the same complex is this little party room that I guess people rent out for birthday parties, I don’t know! It’s a really cosy room for about 100 people with a really great PA. I was playing and this guy comes up and says ‘I know a couple of your songs, can I jam’? And I have no problem with that. Most of the time they’re ok, but some of the times you get a diamond in the rough, and that’s what Dave was! I was blown away by the couple of songs he played and said do you know anymore because you’re bringing the house down! He goes ‘I know your whole catalogue’. And that’s pretty much how he got the gig. I said that I wanted to do it again next year and the following year, and the following year. Actually he has agreed to go, I think its November 16th and 17th; I’m opening for the mighty Y&T at the Mystic Theatre near the San Francisco Bay area and he is coming with me to play. I love playing with this guy and we really have some kind of niche. And he sings like Pat Torpey – I love that! NI ROCKS – You’ve played Belfast now several times. What are your recollections and expectations? ERIC – Well, I hope it’s as good as the last time I played. I played with Pat McManus (note – March 2013, not actually the last time Eric played here) and he opened, which is so weird! Him and I; I don’t know if we’ve had parallel careers, I think he kinda came first, but we had a great time playing together. It was kinda like the beginning of what I’m doing; I’ve perfected it a lot better. I’m a lot more comfortable talking on stage. That’s so funny because I’m mister big-mouth sometimes – Eric shut-up and sing! I kinda cut my teeth on that particular gig; singing and rockin’ out and keeping a show together by myself. I think I’ve gotten better and can hold it together now. And also I’ve got this great guitar player who’s whippin’ out the solos. It’s a better show but that Belfast crowd were great and very forgiving – I had a couple of mistakes I remember! If I break a string, nobody is going to tune it, I don’t have that luxury; I’ve got to do it myself and tell some stories! I’ve plenty of stories now so we’ll be ok.
NI ROCKS – The set-lists will obviously include some of your solo material. The last studio solo album was in 2012 I think (the Japanese “Mr Rock Vocalist” album of covers). When might we see a new solo album? ERIC – Ah man, I’ve been threatening to do that for years! I don’t know! I have been working with a friend of mine, Joel Hoekstra, the guitarist for Whitesnake. I’ve written a couple and he has written a bunch of tracks and I’ve written a couple of things with him. I was gonna do this rock record, but I don’t know! I’m having fun doing the acoustic thing – the Americana, British blues invasion kinda of acoustic vibe and I don’t know. I love writing rock n roll songs, but I can do that with Mr Big. I haven’t done a solo album in thirteen plus years I’m sure (note – “Destroy All Monsters” in 2004 was the last solo album featuring new material) but I gotta do something because after Mr Big...what do I do then! I’m tired of being Taxi-Dad with my kids (laughs). NI ROCKS – If you were doing a new solo album is there anyone in particular that you’d like to have as a guest on the album? ERIC – Yeah! I’ve made a lot of friends since the last time you checked me out! I’d like Richie Kotzen and I to get together. I miss playing with that guy. When he was in the band for a couple of years we definitely had a cool chemistry and I’d like to write some songs with him and have him come and sing with me. And why not get Billy Sheenan and Paul Gilbert – I’d love to have them come in and play, but let me call the shots (laughs). Now that we’re talking about it – anybody that wants to come and write songs with me and thinks that they can do it – Professionals Wanted! NI ROCKS – We’ll play something from your solo catalogue now. Again. I’ll let you pick something to play and tell us why. ERIC – Really! It’s so far back! What do you have? NI ROCKS – I should have it all and if I don’t I can find it! ERIC – There’s a song that was the title track of my acoustic album called “Somewhere In The Middle”. I was..some people can get it together and some people are really lucky in love and they can keep that marriage go-round going and I just couldn’t. I was trying to meet my girl at the time in the middle at some kinda compromise you know. Lyrically it’s such a great song and my diction is perfect so you can totally understand it, so instead of me explaining what it’s about just listen to it and you’ll get it and it’ll heal your wounds; who knows! NI ROCKS – You did quite a comprehensive e-mail interview for us back in January 2013 – it’s actually one of the most read interviews on the website. Quite a bit has obviously happened since then. That includes the release of the Avantasia studio album “The Mystery of Time” on which you appear. You also appear on the subsequent live bonus album that accompanied the “Ghostlights” album. What is it like being part of the Avantasia experience? ERIC – I absolutely love it! It’s ok, I can share my toys; working with really confident and talented people. I’m a hard rocker and kind of a soul singer, but I’d never been in the metal world before. With Mr Big, we’d played Hellfest, Sweden Rock and just recently we played Wacken, but we’re not metal. With Avantasia I’m getting a whole new music sound. I never really listened to Trivium before or Megadeth or Slayer. One of my hometown friends is this guy Chuck Billy who is the lead singer of the band Testament, but I’d never even heard Testament before because I never thought I’d ever dig it! I dig it now because I’ve been around it for the last three or four years now with Avantasia. Tobias Sammet, the main guy – for those of you who don’t know who Avantasia is you’ve got to check it out – it’s this German power metal band with about six singers from all around the world. There’s Michael Kiske from Helloween, Ronnie Atkins who is kind of my toxic twin – I don’t want to talk about it (laughs), we kinda match each other at drinking; only on days off – he’s from the band Pretty Maids, Bob Catley from Magnum, now we’ve got Geoff Tate from Queensryche, Oliver Hartmann and Sascha Paeth is the guitar player who is the producer and he does all those metal bands. 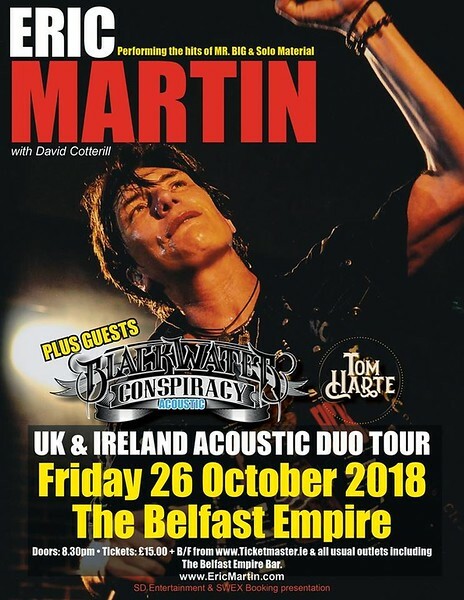 There’s Amanda Somerville and then you’ve got some American kid called Eric Martin – I don’t know how I got picked to do it. I said man I’m a soul singer and he said Eric you’re unique and you’re perfect for it. I said, well it’s your call to put a little soul into the metal. I do have a great time and I just sang on the new album which is called “Moonglow”; I’m singing on a couple of tracks. NI ROCKS – That was my next question. You are involved in the next Avantasia album then? ERIC – I am. I’ve already recorded it. I’m on a song called “The Piper At The Gates of Dawn” and another one called “Maniac”. And I’m part of the live shows as well. We start in March, until June. Then when we’re done I go out with Mr Big. It’s ok, I keep busy! Trust me! I wished for it. NI ROCKS – Those two things will obviously keep you busy – Mr Big and Avantasia. Are there any other projects that you’d like to see happen over the next year or so? ERIC – Any other projects; I barely have any time now that you’ve got me doing a solo album or now that you’ve got me thinking about it! I don’t really have anything. In 2020 I might go out with a....I did this thing that was called Rock Meets Classic where I got to work with Ian Gillen and share vocals on “Smoke on the Water” for about twenty sold out shows – there is going to be something like that in 2020. Maybe me and Joe Lynn Turner and a handful of great rock singers. That’s the only other project that I can think of – I’ve got a full plate! NI ROCKS - I thought we’d play the Avantasia track you sang on “The Mystery of Time” called “What’s Left Of Me”. What can you tell us about that song? ERIC – Not much! I don’t even know what the lyrics mean (laughs). I think that guy has got a bible in the bathroom and he just opens it up! He writes a lot of religion and love, but I don’t really know what it means. It’s a rock opera, so I get that I’m an actor conveying his message. I guess it would help if I actually knew so that I could get into it a little bit more, but I pour every emotion I have into the performance. It’s a great song to sing. My favourite part of that whole gig is a song called “Twisted Mind” that I sing with Ronnie Atkins from Pretty Maids. Ah man, it’s great. I now have a little cred – some of those metal guys thinking who’s this dude? Like I’m a new metal guy! NI ROCKS – Your solo setlists include a variety of tracks from Mr Big and your solo career. How much do they vary from night to night and how do you decide what you want to include at the start of the tour? ERIC – With Mr Big, Billy was just talking about this the other day; how he wants to have three different setlists going on. The next tour that we do we’re going to concentrate more on the first album, because that’ll be like the thirty years anniversary and we’ll concentrate on that, but he wants to break it up into twos or threes so we have a different set. Maybe he’s watching me, because every night I do a different bunch of songs. I’m doing “Gravity” tonight, I did “Green Tinted Sixties Mind” last night. You always see these magazines and they say they played all these dates with the same setlist – ah, boring! NI ROCKS – If you were to include more songs in the setlist that had influenced you as a singer or writer, rather than songs you’d sang yourself, what might they be? ERIC – All the great songs that I love, the original players just done it so well that I would just probably muck it up! The original version of “Whiter Shade of Pale”, but I tell you Glenn Hughes covered it and it was amazing. Sammy Hagar did it and it was pretty good too. I love that song and always wanted to do it, but it just seems pointless as I would just be doing it for me. Hold on. (Talks to tour manager). That was my tour manager, we’ve got to go to sound-check – that’s my out. I can come back to you on that. NI ROCKS – I’ve only really one more question if that’s alright. We’ll finish with another couple of tracks either from Mr Big or your solo work. I’ll let you pick which tracks you want to play. ERIC – From Mr Big, one of my favourite songs and I play it live acoustically is called “Take Cover”. It’s a song that has Pat Torpey’s signature drum beat and hardly anybody, and I’ve had so many people playing that song and they just don’t capture it like Pat did. Every time I play the song it reminds me of him. “Take Cover” – that’s my Pat jam! And, this could be like a Pat Torpey thing, there’s a really cool funky song that is called “Temperamental” and it’s got this really cool latin, cowbell, snare drum, funk, power thing happening at the beginning. That’s one of the grooviest songs and I remembering arguing with the guys who didn’t want to do and them saying you just like funk and me saying ‘yeah’!